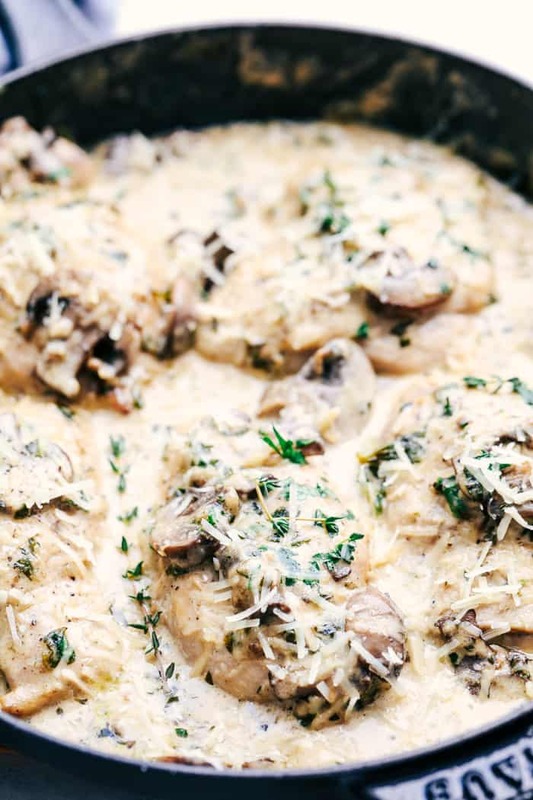 Creamy Parmesan Herb Mushroom Chicken is a 30 minute meal that tastes straight from a restaurant. 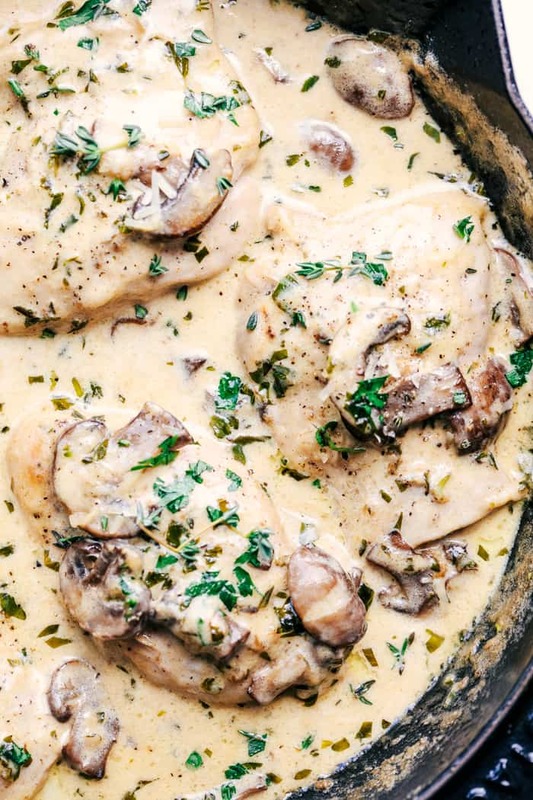 The parmesan cream sauce has fresh herbs and mushrooms that coats the chicken perfectly. This meal is phenomenal! We celebrated my little girl’s birthday a few days ago. She is three!! It is crazy how fast they grow up. This has been such a fun age and we all adore her. She wanted to have a Moana party of course. She talked all week about her “birt-day” and Moana. So the day finally arrived and she was so excited. We had her party at our neighborhood pool and clubhouse. Despite a few birthday mishaps of the cake tipping over in the car or the balloons getting stuck in her bedroom fan, it came together perfectly! A fun time was had by all and it was so fun to watch her on her special day. Now just one more week until we add a new little girl to the family! Since I am at the end of my pregnancy, life is hard. It’s getting hard to walk, sleep, and keep up with everything. But I am all about an easy 30 minute restaurant quality meal for my family. And let me tell ya. If you don’t make this meal you are MISSING out! 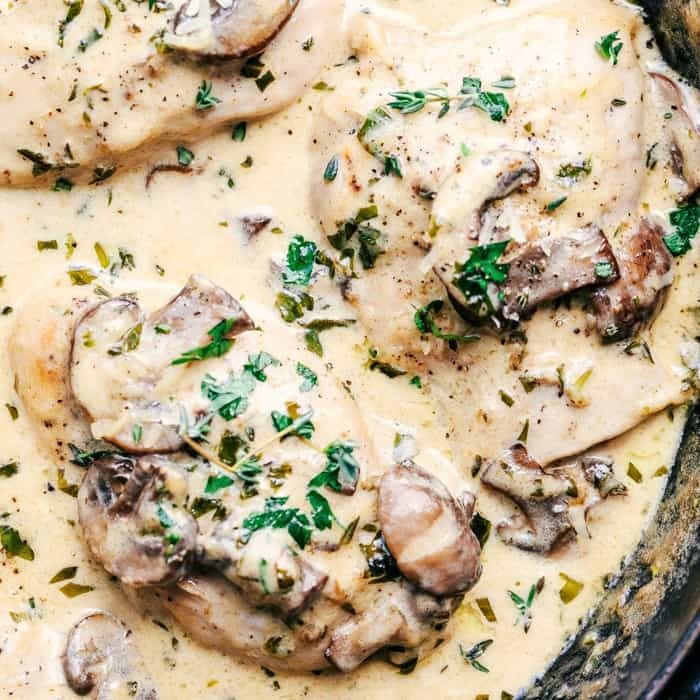 This creamy parmesan sauce. Oh.my.gosh. It is absolute perfection. But I absolutely love when fresh herbs are added to give it amazing flavor. Thyme is one of my all time favorites so of course it was included in the line up. Oregano, basil, and fresh parsley also made their debut making it incredible! The sauce thickened up and coated the chicken perfectly. 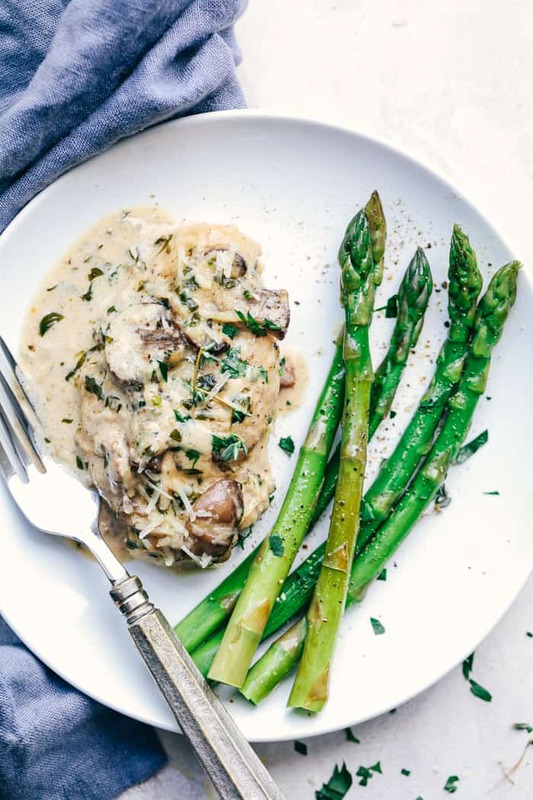 I just served mine with some freshly steamed asparagus, but this would also be amazing served over rice or pasta. 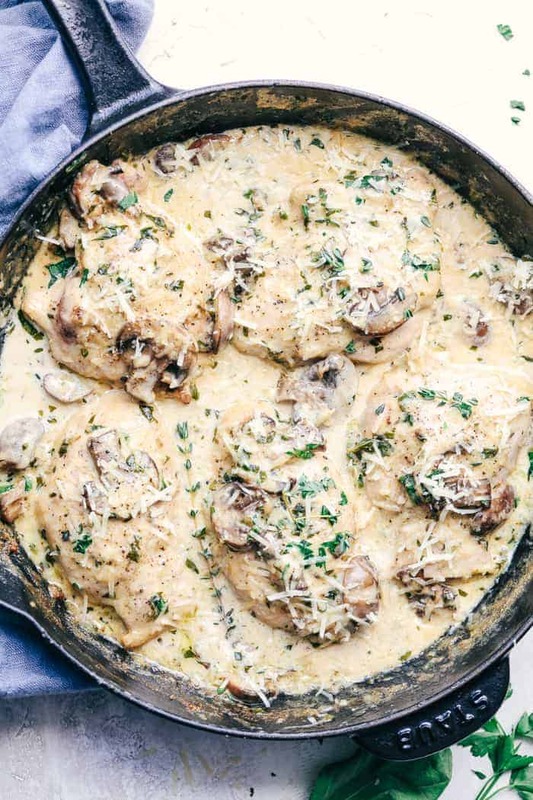 This chicken is so incredible that my family is already begging me to make it again. You will love this one just as much as we did and regret not making it! I promise! Add 2 tablespoons butter and melt. add garlic, fresh herbs and mushrooms. Saute for 1-2 minutes. Add the heavy cream, chicken broth, and parmesan cheese. Whisk over medium high heat until it starts to thicken. Garnish with fresh herbs, chopped parsley, and freshly grated parmesan cheese. The mushroom chicken looks delicious and mouth-watering. Thanks a lot for sharing the recipe. I have an out of town relative coming soon for visit. Saying she’s a picky eater is an understatement. This she would eat. Thanks for a great recipe. Enjoy your new blessing. Looks good! Quick question. are you using a stainless steel pan, a cast iron skillet or a non-stick pan of some sort? Thanks. In this picture and when cooking this chicken I used the STAUB cookware. It is an enameled cast iron and bakeware pan. A stainless steel pan or a non-stick pan would work great too! Hope that helps!! YAY… It follows Atkins which is how I am eating. Definitely making this week…. Made this the other night and it was delicious. An absolute hit in my house. That is awesome!! Thanks so much for sharing! I am so glad everyone enjoyed it!! Delicious! This is becoming my fave recipe blog. I made it with a side of angel hair pasta, delicious with the sauce and sauteed garlic green beans. This recipe came up on my feed on FB and I made it last night and it was excellent. Didn’t change a thing. You have a really nice blog and I’m looking forward to trying some of your other recipes. Thanks! Just tried it. The sauce was delicious but it didn’t thicken like i hoped it would. What did i do wrong? Any advice? I added about a tablespoon of flour and it thickened great! I added a tad of xanthum gum and it thickened nicely!! So delicious and husband approved!!!??? Hello and thank you for taking the time to share this super simple and yummy recipe. I made this for dinner and wanted to give some feedback with a few tweaks I had to make. I used chicken breasts with bone but without skin and actually made sure chicken was cooked all the way through, so it was definitely more than a few minutes per side. Once it was cooked through, I added the remaining ingredients only I cheated slightly and used dried herbs because I didn’t have fresh. Not sure what the difference in flavor would’ve been but it was amazing this way. And I did double the sauce because I wanted to make sure it was enough for the pasta I decided to use as a side dish to soak up. Having said this, I allowed sauce to cook on very low heat with the chicken for an additional 15 minutes. Again, my fear is always under cooked chicken but having doubled the sauce helped ensure it didn’t dry up. Thank you again. It;’s super yummy!